As most of you probably already know, I did a DIY refashion of a Men’s Shirt to a Cute Summer ShirtDress that I posted back in August. 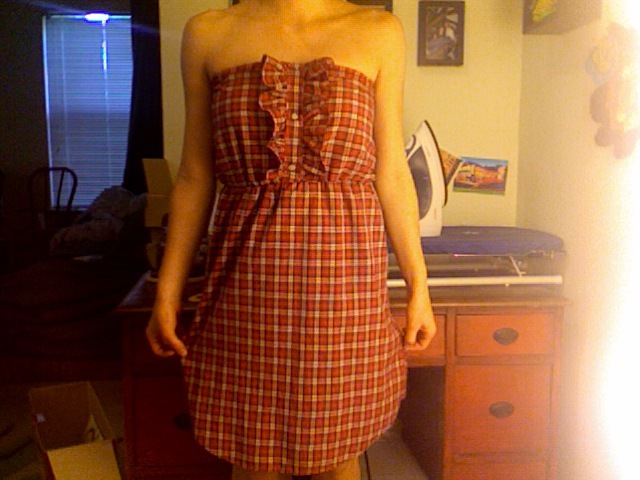 One of my lovely readers, Amanda V., sent me a photo of the dress she made following the tutorial. 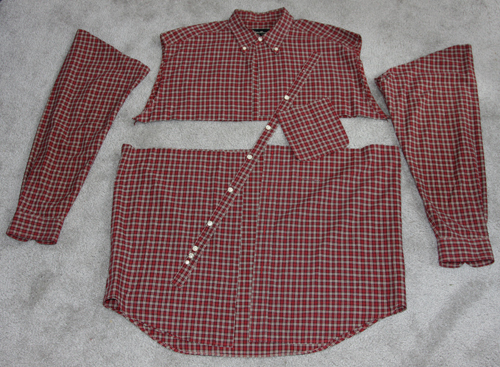 So I decided to do another shirt dress tutorial…this time using a men’s plaid shirt as the base, and changing up the front embellishment. 2. 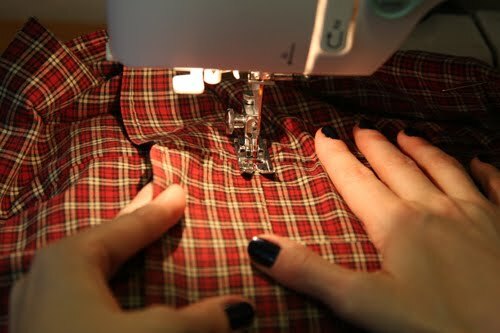 Remove buttons from button placket. 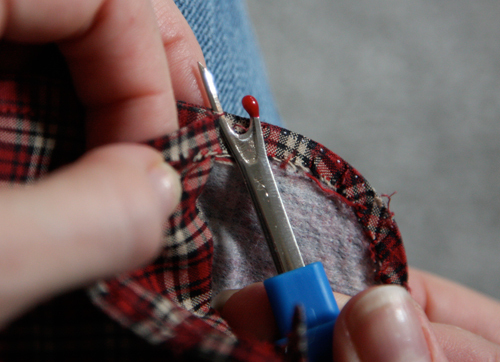 Use seam ripper to open topstitched edges of button placket, making it into a flat piece of fabric. 3. 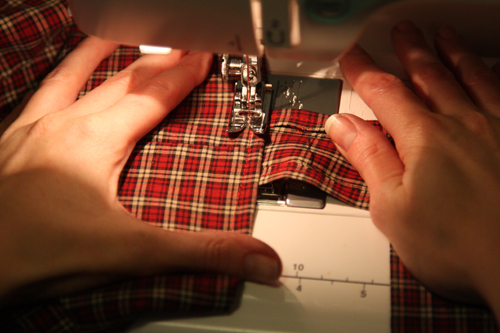 Use seam ripper and open cuffs up at edge seams all the way to buttonholes; remove buttons. Cut off ends of cuffs where the buttonholes are (we won’t use those parts). 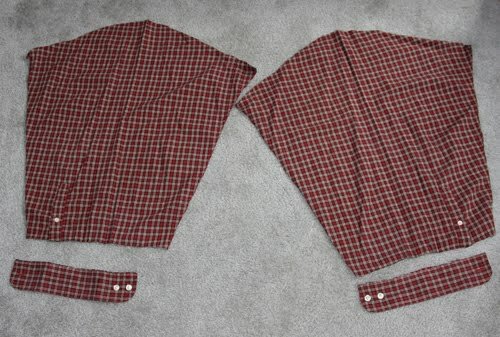 Peel off any interfacing that’s stuck to your cuffs and discard. 6. Topstitch sleeve opening plackets closed on the back side of your bodice. 8. 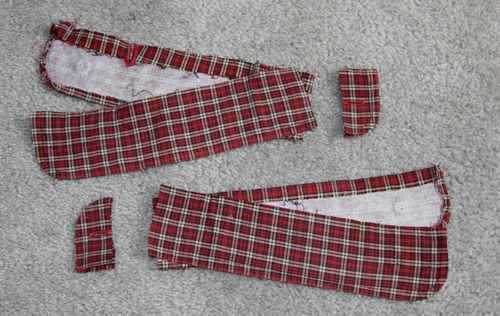 Sew all cuffs together at their ends. 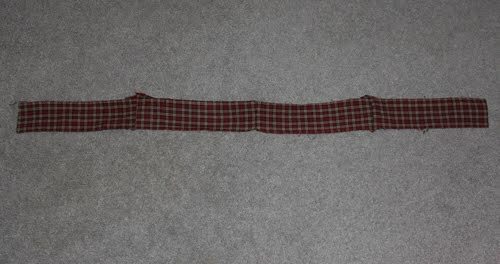 This is what the waistband will look like once all your cuffs are connected. 9. 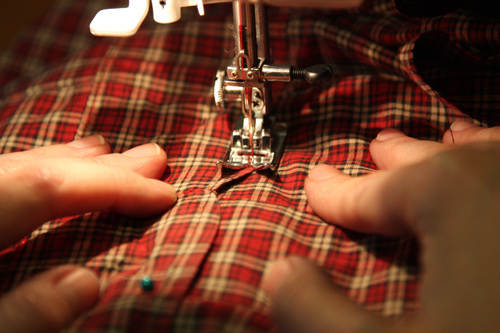 Turn under about 1/4″ on each long side of the button placket you ironed back in Step 2). Sew 1/8″ from edges. 14. 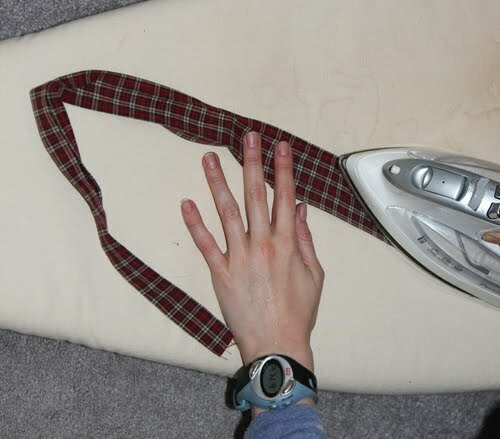 Create side seams by the same method, using the side seams on your sports bra/tank as guidelines. I know it looks like it’s pulling in a lot of directions – mostly it’s because I’m raising one arm to take the photo. 15. Take off the bodice and sew the darts on your machine, starting at the bottom and moving up to the bust point. Leave two long threads at the end and knot the threads. 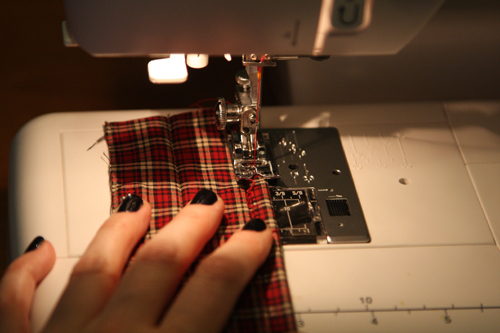 Sew the side seams, and trim the seam allowance, notching where necessary. 17. 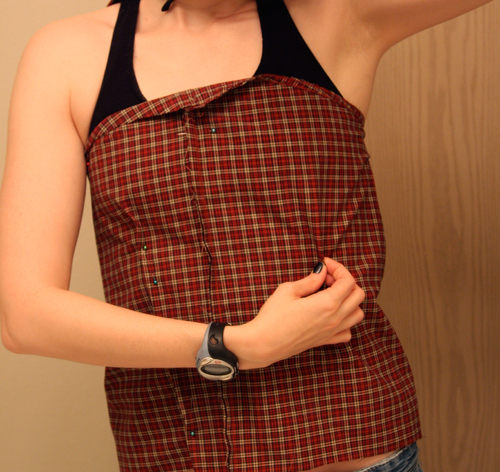 Pin the bodice back on your shirt/bra top. Pin the skirt underneath (onto a pair of tight-fitting leggings/underwear that you’re wearing underneath). 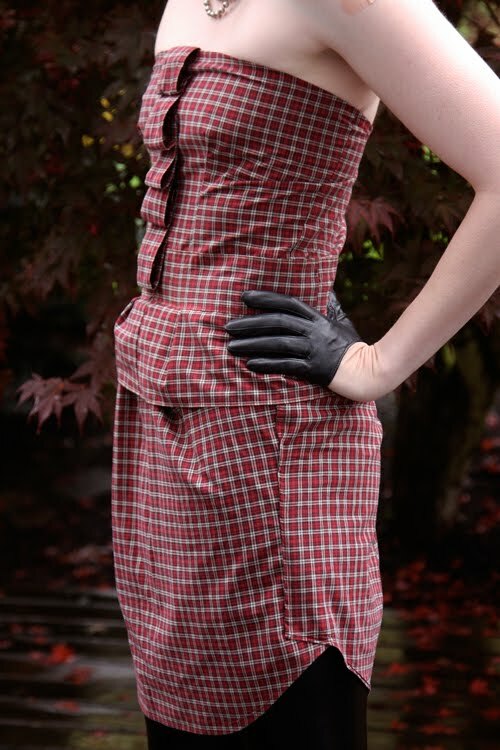 Make sure the skirt underlaps the bodice part all the way up to your waist, since that will be the connection point of the skirt and the bodice. You need to match the side seams of that skirt to the side seams of what you’re wearing on the bottom…and place the seam that you sewed down the front of the shirt…at your center back. 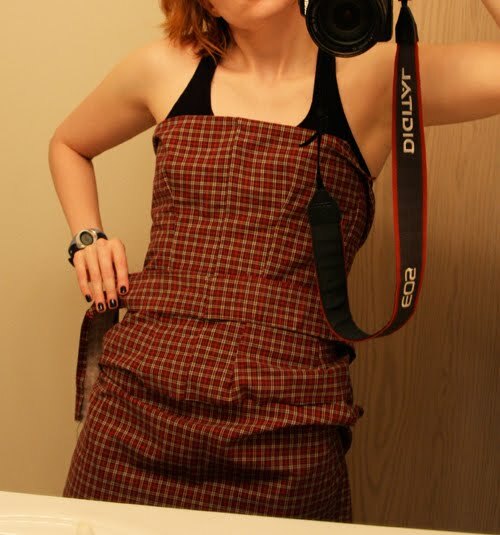 Place waistband over bodice at your natural waist, matching center fronts. Pin waistband to bodice all the way to the side seams. 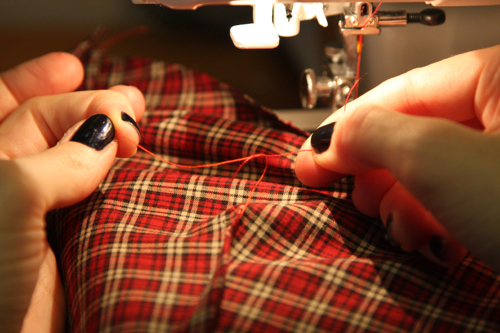 Make sure top of skirt underlaps bottom of waistband (or top of waistband, if you want a super-short miniskirt). 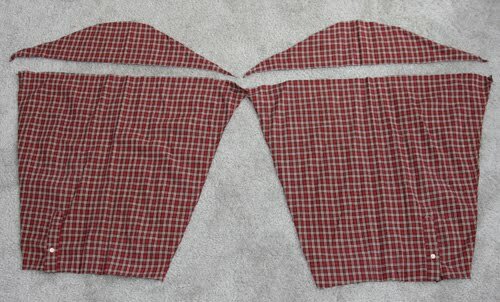 Pin skirt bottom to bodice in center and at side seams only. 18. 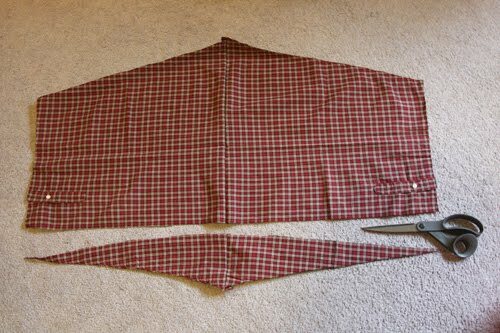 Place dress on a flat surface. Continue pinning waistband all the way around to back parts of bodice. Pin skirt back to bodice back (pinning thru waistband) and gathering skirt at back where needed. 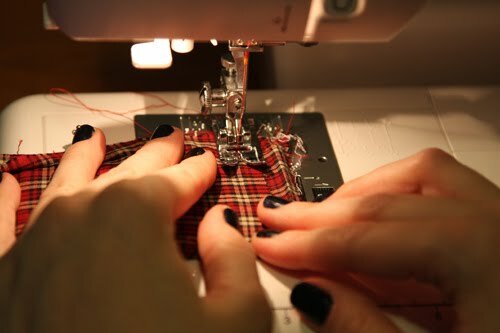 Gather skirt at front between pins, and pin gathers in place.Creating gathers in the skirt part with my fingers. 19. Topstitch top of waistband through all layers. 20. Topstitch bottom of waistband through all layers, preserving gathers in skirt as you stitch through them. You can see the angle of the peplum at the center back. 21. 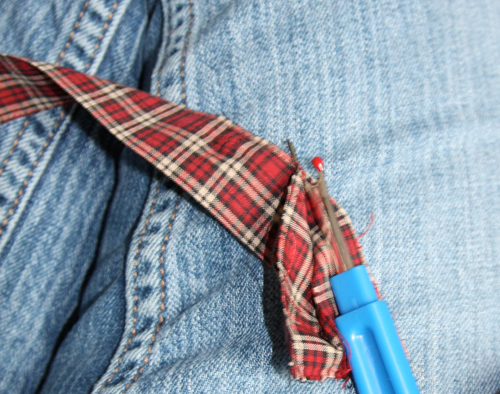 Using a seam ripper, open the front bodice darts below the waistband to create a flared peplum. 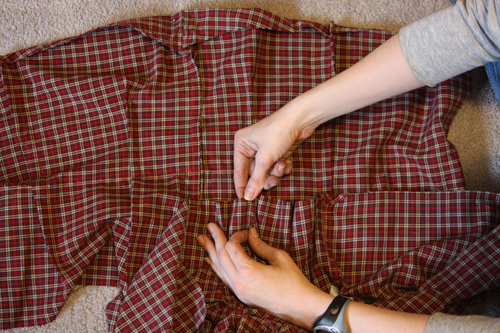 Fold under the ends of your peplum at an angle towards the center back, and topstitch edges. 24. Place the dress on a flat surface and pin the zipper to one side of the CB opening. 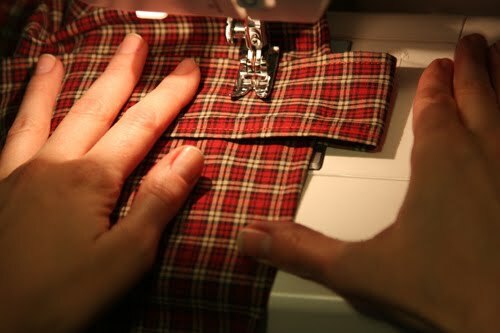 Sew the zipper on one side, using a zipper foot. (Pre-basting if necessary.) Close the zipper, pin to other side of CB opening, and sew. Make sure not to catch the peplum in your stitching. (not pictured) Trim seam allowance next to zipper. 27. Place top of flattened button placket on underside of top of bodice, matching edge of placket to edge of bodice top seam allowance. Center on bodice. Stitch placket to bodice on right side, going through all layers. 28. 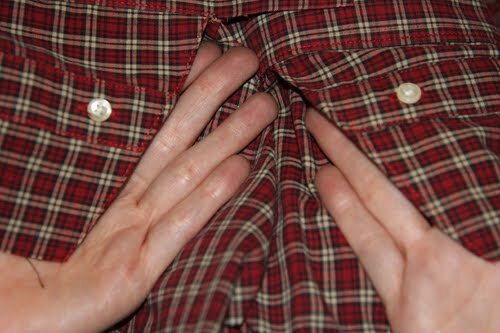 In order to make the cascading folds in the placket, measure out about 2″ from secured top of placket, and fold under, underlapping about 0.5″. Sewing the first fold. The loop will actually hang a little below the line of sewing, camouflaging it. 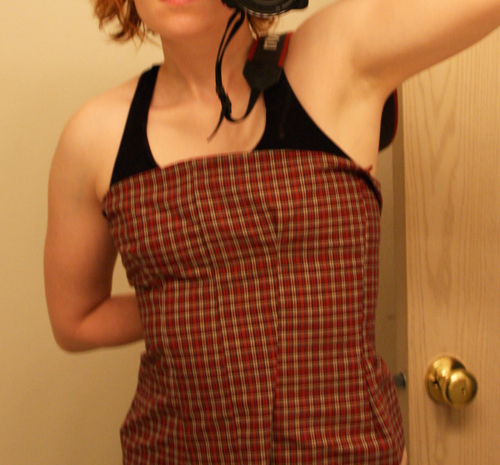 Work from the top to the bottom of the bodice in this way. 29. To create a tulip-like effect to the skirt, overlap the edges at the side seams slightly, pin, and topstitch.Believe it or not, you’re finally done!! I’m a Misses’ Size 4/6 (usually a S in dresses though sometimes a medium because my waist is kind of thick). 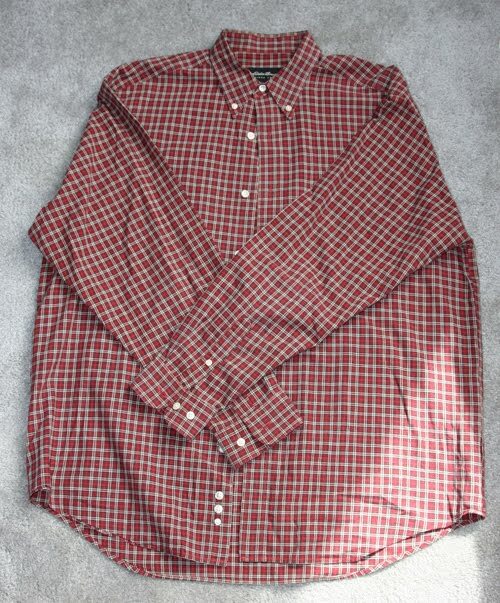 A Men’s M shirt was sufficient for my size…if you are larger, choose a larger shirt to work with! Not loving the ripply back, though. It might need a little nip in the back to make it sit right. Thoughts: I’m thinking this is just too many elements for one dress. The point is for you to add and take away as you like. The peplum is not as full as I would like it – instead of being fashioned out of the bodice, it needs to be made from a completely rectangular piece of fabric to create the necessary flare. I’m also not liking the skirt gathers; I think instead the skirt should have pleats in the front to create the tulip shape; the gathers just look messy to me. I’m going to do a little makeover on this piece, but otherwise, I hope this gives you the tools to make your own! This is absolutely awesome! I love it! 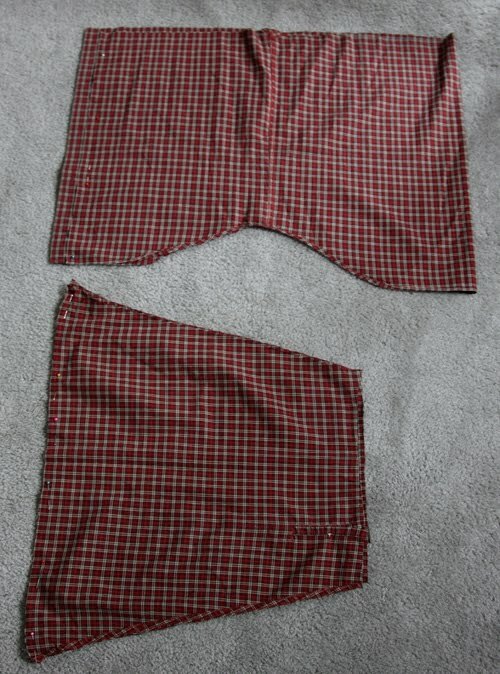 I'm not quite advanced enough in my sewing skills to try it, but definitely bookmarking it for later. Thanks so much! I have been meaning to do this for a long time (it is such an amazing tutorial) but now many pictures are not showing up on my computer. I doubt I can do this with out pictures so I was wondering if you had any suggestions. You are great! Hi Jocelyn – a lot of my pictures were lost when I made the migration to WordPress. I’ve re-uploaded all of them, so they should be showing up now. Hope that helps, and thanks for letting me know! Good luck with the dress!